Nurse practitioners work as advanced practice registered nurses whose graduate education qualifies them to prescribe medications, treat illnesses, and educate patients. These valued members of patient care teams make for an integral asset to physicians. An online nurse practitioner degree marks a good investment in today's job market. According to the Bureau of Labor Statistics (BLS), nurse practitioners earn a median annual salary of $103,880, and the field is projected to grow 36% between 2016 and 2026. Nurse practitioners enjoy highly rewarding and fulfilling careers. Nurse practitioners work closely with their patients, providing advanced caregiving. WHY ARE ONLINE NURSE PRACTITIONER DEGREES BENEFICIAL? Earning an online nurse practitioner degree allows students to acquire advanced skills in the field, earn higher salaries, and take on additional responsibilities. Many schools offer the opportunity for students to earn their master's in nursing completely online. Learners should check with their prospective school about any on-campus requirements. Read more here. HOW MUCH IS A MASTER'S OF NURSING ONLINE DEGREE? Online tuition for a master's in nursing varies by institution and depends on a number of factors, including residency status. Check directly with schools for accurate tuition estimates. Read more here. Students must meet a school's admission requirements, and after enrolling, complete all program requirements. For more accurate information, students should check directly with their prospective school. Read more here. Yes, but students must make sure their prospective schools have proper accreditation -- whether regional, national, or programmatic. The best online nursing schools receive both regional and programmatic accreditation.Read more here. The best online master's in nurse practitioner programs give students the skills they need to manage their increased responsibility. Nurse practitioners work closely with their supervising physicians to diagnose, treat, and prevent illnesses. To become a nurse practitioner, you must first become a registered nurse (RN), or hold a bachelor's in nursing. Since requirements vary by program, carefully review the application process for each prospective program. When choosing an online program, consider your daily life and anticipated weekly time commitment. Choose a program with enough flexibility for your life, and the resources to help you achieve your career goals. WHAT ARE THE ADVANTAGES TO EARNING MY MASTER'S IN NURSING ONLINE? Online learning allows students greater flexibility. Many programs are available entirely online with asynchronous instruction, allowing students to decide when and where to complete their coursework. Georgetown University in Washington, D.C. holds distinction as the nation's oldest Catholic and Jesuit institution of higher education. Established in 1789, Georgetown offers programs through nine schools and colleges at its main and medical campuses. Georgetown's School of Nursing and Health Studies, founded in 1903, provides several nurse practitioner programs, including a specialization in adult-gerontology acute care (AG-ACNP). Georgetown's online master of science in nursing AG-ACNP degree offers registered nurses part-time coursework to build expertise in managing acute and chronic conditions in patients. Nurses with at least one year of clinical experience in an intensive care, emergency, telemetry, or progressive care unit can prepare for national certifications from the American Nursing Credential Center and the American Association of Critical-Care Nurses in caring for adult and older adult patients. Learners complete 40 credit hours of synchronous coursework and between 600-700 clinical hours in 23 months. Students also participate in three on-campus intensive residencies. During on-campus intensives, students work with standardized patients who portray the medical conditions and emotional aspects of patient care common in clinical experiences. Students build assessment, diagnostic, technical, and communication skills through experiential learning activities. Applicants to Georgetown's online nursing AG-ACNP program must hold an accredited bachelor's degree or comparable nursing degree from an accredited institution. Learners also need a current nursing license and must submit a resume, transcript information, three letters of recommendation, a personal statement, and a live recorded interview for consideration. Georgetown's online master of science degree in nursing holds accreditation from the Commission on Collegiate Nursing Education. With more than 26,000 undergraduate and graduate learners, George Washington University in Washington, D.C. traces its origins to an Act of Congress in 1821. GW's 10 schools and colleges at its main, Mount Vernon, and Virginia Science and Technology campuses emphasize student experience, research, and philanthropy. GW's School of Nursing offers an online master of science in nursing-nurse practitioner program with seven degree paths. Practicing nurses enroll in adult-gerontology acute care, adult-gerontology primary care, family nursing, nurse leadership, nurse midwifery, or online RN-to-MSN degrees to advance current nursing knowledge and skills. Programs include 36-50 credit hours, with multiple on-campus requirements. Learners complete on-campus learning and skills coursework early in the program in anticipation of additional experiential learning exercises and program skill assessment exams. Students enrolled in degree specializations also participate in hands-on trainings in acute care, primary care, diagnostics, and patient care management. Students also complete between 600-700 clinical hours for degree completion. Applicants to GWU's online nurse practitioner program must hold a bachelor's degree in nursing from an accredited college or university with a minimum 3.0 GPA. For consideration, students submit official transcripts, two letters of recommendation, a resume, a personal statement, and proof of active nursing licensure. GW's School of Nursing's master of science in nursing program maintains accreditation through the Commission on Collegiate Nursing Education. Founded in 1957, Stony Brook University sits on a 1,039-acre campus on the north shore of Long Island in New York. Stony Brook offers almost 350 undergraduate and graduate programs and boasts an 18-to-1 student-to-faculty ratio. More than 26,000 students enroll in degrees offered through one of Stony Brook's 12 schools and colleges, including the online master of science family health nurse practitioner program. The online family health nurse practitioner degree includes 45 credit hours of required coursework in research, pharmacology, health assessment, and pathophysiology. The curriculum focuses on managing health problems through health promotion, supervision, and restoration. Core classes in theory and interventions in family settings; healthcare policy and advocacy; organizational leadership and role transformation; and quality, safety, and healthcare technologies prepare students to participate in four advanced theory and clinical practice courses. Learners complete online coursework and clinical placements that allow them to pursue national certifications as family nurse practitioners from the American Academy of Nurse Practitioners Certification Board and the American Nurses Credentialing Center. Practicing nurses who apply to Stony Brook's family health nurse practitioner program need either a bachelor's degree in nursing or to submit a clinical practice portfolio. Applicants should boast one year of experience and provide unofficial transcripts, a current nursing license, three letters of recommendation, and prior coursework in health assessment and statistics. Master's degrees in nursing offered by Stony Brook's School of Nursing hold accreditation through the Commission on Collegiate Nursing Education. Based in Orlando, the University of Central Florida offers more than 220 degrees at its 1,415-acre main campus, locations around the state, and online. UCF grew from 2,000 students when it opened in 1968 to its current enrollment of just under 70,000. As one of Florida's 12 public universities, UCF provides undergraduate and graduate degrees through its 13 colleges. UCF's College of Nursing offers three master of science in nursing degrees. In addition to nurse educator and nurse and healthcare simulation programs, the online master of nursing leadership and management track builds advanced competencies for practicing nurse professionals. The leadership and management curriculum trains nurses in patient management, advanced practice, healthcare innovation, and developing collaborative teams within the medical field. Learners complete 36 credit hours in nursing theory, organizational dynamics, healthcare informatics, and financial management and resource development. Students also study leadership role specialization through clinical practicum coursework and participate in an evidence-based nursing practice scholarly project. Learners apply degree principles and theories during a nurse leadership and management internship. To apply to UCF's online master's in nursing leadership and management, learners must hold a bachelor's degree in nursing from an accredited institution. Students without a nursing degree must complete prerequisite coursework, and all applicants need prior classes in statistics. Applicants must submit proof of a valid nursing license, a resume, and a written essay prior to a potential interview with a faculty member. UCF's School of Nursing maintains accreditation through the Commission on Collegiate Nursing Education. Founded as Nebraska's first school of nursing in 1888, Clarkson College now offers academic programs in disciplines like healthcare business, health information management, and health education leadership. As a private nonprofit institution, Clarkson College maintains accreditation through the Higher Learning Commission and offers students a 16-to-1 student-to-faculty ratio. Clarkson College offers master of science degrees in nursing healthcare administration, nursing education, adult-gerontology primary care for nurse practitioners, and family nurse practitioner practice. Clarkson College's online master's in nursing for family nurse practitioners totals 47 credit hours that prepare students to assess, care for, and maintain the health needs of the entire family. Learners complete 21 credit hours of core coursework, including an evidence-based research research project. Additional core classes in scholarly writing, nursing law and ethics, research methods, and applied statistics prepare students for concentration courses. Specialized classes in advanced physical assessment; pathophysiology; nutrition; and primary care of children, adolescents, and women accompany sequential clinical requirements completed on weekends. Clarkson College offers three start dates per year for applicants with a bachelor's degree in nursing from an accredited institution. Learners must demonstrate a minimum 3.0 GPA and provide documentation of a valid unencumbered nursing license. Additional application materials include an application fee, formal application, scholarly essay, resume, two letters of recommendation, and an acute care skills assessment form. Clarkson College's nursing programs hold accreditation from the Accreditation Commission for Education in Nursing. The Ohio State University in Columbus offers educational programming at campuses and research centers throughout the state. Founded in 1870 as a public, land-grant institution, OSU's main campus includes almost 1,800 acres, more than 20 libraries, the Wexner Center for the Arts, Ohio Stadium, and the OSU College of Nursing -- which holds accreditation from the American Nurses Credentialing Center (ANCC). OSU offers four master of science in nursing degrees with three options for nurse practitioners. The online nursing degree for neonatal nurse practitioners trains nurses to work with neonates, infants, and young children up to the age of two. OSU's online family nurse practitioner program prepares students for clinical positions in private practice, clinics, hospitals, managed care organizations, and government agencies. Family nurse practitioner learners gain the competencies to design, implement, and monitor the health needs of individuals, families, and groups. OSU's nurse practitioner program for psychiatric mental health nurses emphasizes providing mental healthcare to individuals of all ages in inpatient and outpatient settings. Learners explore theories and techniques applicable to mental health and substance abuse disorders. Nurse practitioner students complete 55-61 credit hours with accompanying clinical requirements. OSU's online nurse practitioner programs prepare nurses for professional certification through the ANCC. Admission to OSU's master's degree in nursing program requires a bachelor's degree with completed prerequisite coursework. Learners must demonstrate a 3.0 GPA or higher by submitting transcript information with a formal application, resume, purpose and goals statement, and three letters of recommendation. Applicants also submit a recorded interview for consideration. Gonzaga University in Spokane, Washington, adheres to its Jesuit mission through educational programs that combine Catholic, humanistic values and academic excellence. Founded in 1887, Gonzaga hosts more than 7,500 students at its 152-acre campus by the Spokane River. Learners enjoy a 12-to-1 student-to-faculty ratio in courses offered through one of the private institution's seven colleges and schools. Gonzaga offers three master of nursing programs for nurses who seek to advance their careers. Both of Gonzaga's online master of science in nursing for nurse practitioners degrees comprise 47 credit hours. Family nurse practitioner and psychiatric mental health nurse practitioners complete core coursework in topics like theoretical foundations of healthcare improvement, evidence-based practice for quality and safety classes, advanced pathophysiology, pharmacology, and health assessments courses. The family nurse practitioner curriculum emphasizes primary care for infant, children, adult, and geriatric patients, while the psychiatric mental health nurse concentration focuses on psychiatric mental health nursing concepts. Coursework may include clinical hours at an approved location. Learners also complete on-campus immersions throughout the program and a 600-hour health assessment practicum. Applicants to both nurse practitioner degree tracks at Gonzaga must hold a bachelor's degree from a regionally accredited institution and an unencumbered nursing license. Learners without one or both must take four foundational nursing courses. Additional application materials include transcript information, two letters of recommendation, a statement of purpose, resume, and formal application. Gonzaga's nursing programs hold accreditation from the Commission on Collegiate Nursing Education. Founded in 1855, Michigan State University serves as the model for land-grant institutions as established by the Morrill Act of 1862 and sits on a 5,200-acre campus in East Lansing. With research and educational outreach activities throughout the state, MSU provides academic programs to more than 50,000 learners. MSU offers over 200 undergraduate, graduate, and professional programs, including an online master of science in nursing for family nurse practitioners and adult-gerontology nurse practitioners. 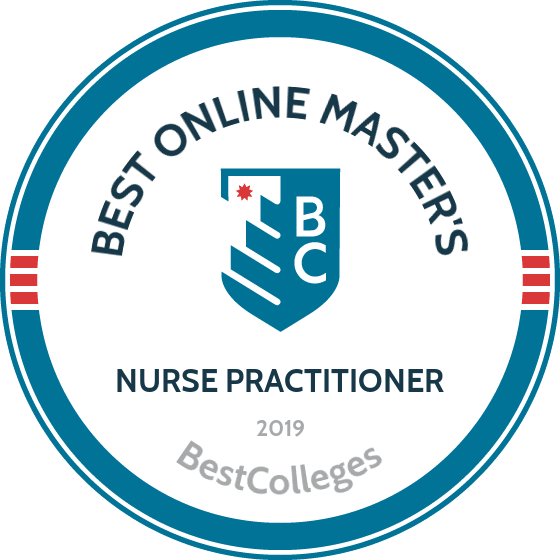 Learners enrolled in the online MSN for nurse practitioners can emphasize a family nurse practitioner or adult-gerontological nurse practitioner curriculum. Both curricula include core coursework in theoretical foundations and role development for nurses, statistics for healthcare professionals, research for advanced practice nurses, and clinical decision making. Adult-gerontology nurse practitioner students study care for aging individuals. All learners explore health assessment and primary care management in anticipation of two nursing practica. On-campus requirements include lectures, seminars, groups work, simulation labs, and exams. The online adult-gerontology clinical nurse specialist with a concentration in nurse education focuses on advanced practice nursing coursework in research, pathophysiology, and pharmacology. Learners complete a clinical nurse specialist role internship and a comparable immersion with an optional thesis. Applicants to MSU's online nursing degrees need a bachelor's degree in nursing with a minimum 3.0 GPA. Those admitted to the nurse practitioner track average just over four years of experience and a 3.7 GPA. Professional nursing experience for the adult-gerontology clinical nurse specialist program averages six years and a 3.55 GPA. Additional application materials include a formal application, transcript information, references, an essay, and a resume. Nursing programs at MSU hold accreditation through the Commission on Collegiate Nursing Education. Villanova University, located in Villanova, Pennsylvania, owes its foundation to the Order of Saint Augustine's intellectual tradition. Founded in 1842, Villanova offers undergraduate and graduate programs through five colleges, including the M. Louise Fitzpatrick College of Nursing. Villanova's online master's in nursing for nurse practitioners includes three concentrations. The adult-gerontology nurse practitioner track trains practicing nurses to work with adult and older adult populations in primary care settings. Villanova's family nurse practitioner program offers knowledge and skills applicable to caring for patients of all ages, while the pediatric nurse practitioner curriculum emphasizes advanced practice in pediatric primary care. Students in all three programs complete core classes online or on campus. Core coursework includes theory and practice of clinical ethics, nursing research, nursing science, and leadership strategies in nursing. Through support and clinical classes, learners acquire specialized competencies and gain hands-on experience working with patients. Students complete 39-55 credit hours and 600-700 clinical hours. Full-time students can finish the program in as few as 18 months, while part-time learners finish in 36 months. Villanova's nurse practitioner program offers learners three start dates each year. Applicants to Villanova's online nurse practitioner programs submit an online application, a personal goals statement, and transcript information from an accredited bachelor's program. Learners must demonstrate a minimum 3.2 GPA or submit accompanying GRE scores. A minimum of one year of professional experience, licensure as a registered nurse, and the completion of a statistics course round out prerequisite requirements. Nursing programs at Villanova hold accreditation through the Commission on Collegiate Nursing Education. The University of Connecticut, based in Storrs, includes four additional regional campuses across the state. UConn began in 1881 with only 13 students and has since grown to offer undergraduate and graduate programs to more than 32,000 learners. UConn's 14 schools and colleges include a nursing school, founded in 1943. UConn's School of Nursing offers an online master of science for neonatal nurse practitioners. Designed for practicing neonatal nurses who want to advance their competencies and careers, the 44-credit program includes online courses and three on-campus residencies. Learners also complete three practica during the program. Coursework in the neonatal nurse practitioner program includes advanced health assessment, neonatal nursing theory, statistical methods in nursing, and nursing research in advanced practice. During two of the three on-campus residencies, learners participate in specialized simulations as they prepare for practicum placements. Students need at least two years of full-time RN-level experience in a level-three neonatal intensive care unit before beginning clinical practicum classes. Part-time learners can complete UConn's neonatal nurse practitioner program in 6-7 semesters, while full-time students can earn a degree in five semesters. Upon program completion, graduates can apply for the neonatal practitioner exam offered through the National Certification Corporation for the Obstetric, Gynecological, and Neonatal Specialties. To apply to UConn's online neonatal nurse practitioner degree, students must submit three letters of reference, a resume, transcript information, a formal application, and responses to essay prompt questions. Applicants can apply for one of three start dates each year. Located in Greenville, North Carolina, East Carolina University began as a teacher training school founded in 1907 on 43 acres and grew into an institution spread across six campuses and regional locations. ECU's nine colleges and four professional schools offer undergraduate and graduate programs to almost 30,000 learners. ECU's College of Nursing offers online master of science in nursing degrees for clinical nurse specialists, neonatal nurse practitioners, nurse midwifery, nursing leadership, and psychiatric-mental health nurse practitioners. The clinical nurse specialist degree includes tracks in adult-gerontology and neonatal nursing. Programs include 37-43 credit hours, depending on the concentration. Students in all of ECU's online nursing master's degrees complete coursework in theory and research for advanced practice nursing before specialized classes and clinical placements. The adult-gerontology clinical nursing curriculum includes concentration coursework in health promotion and disease prevention; influencing healthcare quality, safety, and policy; and clinical practice across the adult lifespan. The psychiatric-mental health nurse practitioner degree emphasizes neuroscience and psychopharmacology in advanced nursing practice and diagnosis, disease management, and psychotherapeutic treatment of adults. Applicants to ECU's online master's in nursing degrees must hold a bachelor's degree in nursing from an accredited institution with a minimum overall 2.7 GPA and a nursing coursework GPA of at least 3.0. The nursing midwifery program requires a GRE, but some concentrations may waive the requirement. Additional application materials include an unrestricted nursing license, personal statement, three professional references, a personal interview, and documentation of clinical experience. ECU's College of Nursing holds approval from the North Carolina Board of Nursing. Master's in nursing programs maintain accreditation through the Commission on Collegiate Nursing Education, with the nurse-midwifery concentration receiving accreditation from the Accreditation Commission for Midwifery Education. The University of Alabama in Tuscaloosa provides more than 38,000 learners undergraduate and graduate programs through 13 schools and colleges. As the oldest public university in Alabama, UA traces its foundations to 1818. UA's Capstone College of Nursing awarded its first degrees in 1978 and currently offers baccalaureate, master's, doctoral, and post-graduate nursing programs. UA's online master of science in nursing for nurse practitioners includes three degree tracks. Learners complete primary care or mental health concentrations or enter a dual concentration program. The dual concentration curriculum includes 53 credit hours, while the individual concentrations take 40-42 credits. Core coursework for all tracks explores advanced health assessment, pharmacology, and pathophysiology. Concentration-specific courses in subjects like psychiatric treatment modalities for mental health students and primary care for rural families precede residency requirements. UA also offers an online master of nursing in clinical nurse leadership. Designed for practicing nurses to build communication, managerial, and decision-making skills, the 39-credit curriculum includes coursework and immersive experiences. Classes focused on issues in community health for rural population, basic epidemiology, informatics in healthcare, and fiscal resource management allow learners to build competencies in evidence-based practice, risk assessment, and patient outcome evaluation. Applicants to UA's online nursing master's degrees must hold a bachelor's degree in nursing from an accredited school of nursing with a 3.0 GPA and an unencumbered nursing license. UA's online nurse practitioner program only accepts applicants with nursing licenses in Alabama, Florida, Georgia, or Mississippi. Master's degrees offered by the Capstone College of Nursing maintain accreditation from the Commission on Collegiate Nursing Education. Simmons in Boston, Massachusetts began as a liberal arts college for women in 1899. Enrolling almost 6,000 students, the private liberal arts institution currently offers more than 60 academic programs. Simmons' undergraduate degrees, which primarily cater to women, accompany the school's coeducational graduate programs in nursing, health science, education, management, communications, and liberal arts. Simmons’ online master of science in nursing degree for family nurse practitioners emphasizes advanced nursing competencies for practicing registered nurses. Over the course of the program, students learn to create and manage treatment plans, make diagnoses, prescribe medication, and promote disease prevention and health management. The 48-credit hour curriculum includes seven foundational courses in topics including pharmacology across the life span, interdisciplinary perspectives on the healthcare system, and global perspectives in health promotion. Learners complete three research courses and eight clinical classes in decision-making, health and illness family theory, and primary care nursing across the lifespan. During the degree, students participate in a minimum of 672 clinical hours and visit campus for seminars and workshops in wound assessment, suturing, and post-suturing care. Simmons' nursing programs hold accreditation from the Commission on Collegiate Nursing Education. Part-time students complete Simmons College's online master's in nursing program in seven semesters, while full-time learners earn the degree in five. Applicants must hold a bachelor’s degree from an accredited institution and a current registered nursing license. Prerequisite coursework includes statistics and health assessment. Additional application materials include a current resume, three letters of recommendation, a personal statement, and a formal application. Based in Fort Lauderdale, Florida, NSU developed when Nova University merged with the Southeastern University of Health Sciences in 1994. Currently, NSU offers academic programs throughout the state of Florida and in Puerto Rico as the largest private, nonprofit Hispanic-serving higher education institution. Through the Ron and Kathy Assaf College of Nursing, NSU offers online master of science in nursing degrees for advanced practice registered nurses. The university offers concentrations for prospective adult-gerontology acute care nurse practitioners, family nurse practitioners, and psychiatric-mental health nurse practitioners. All programs include fully online core coursework, but also include hybrid courses and practicum experiences to build knowledge and hands-on skills. Learners begin clinical practice during the fourth semester of the program. Core classes in each curriculum cover advanced nursing roles, nursing theory and research, pharmacology, and healthcare policy and leadership. Specialized courses in the psychiatric-mental health program include developmental theories for child and adolescent mental health and modalities of psychotherapy, while the family health concentration incorporates courses in primary care across the lifespan. The adult-gerontology acute care curriculum focuses on restorative care in clinical conditions affecting adult and elderly populations. To apply to NSU's master's in nursing program, learners must hold a bachelor's in nursing with a minimum GPA of 3.0. Applicants with bachelor's degrees in other areas must complete additional prerequisite coursework before beginning program classes. Additional application requirements include a current Florida nursing license, a resume, one year of active clinical practice, and residency within 150 miles of campus. Master's programs in nursing at NSU maintain accreditation through the Commission on Collegiate Nursing Education. After joining the University of Texas System in 1967, UTA quickly expanded from its origins as an agricultural and military school, growing its campus to 420 acres, with more than 100 buildings. UTA provides undergraduate and graduate programs to 42,000 learners from its main Arlington campus, its location in Fort Worth, and online. The online nurse practitioner program at UTA offers five concentration options. Learners may enroll in specialized degrees for pediatric acute care, pediatric primary care, adult gerontology primary care, adult gerontology acute care, or family nurse practitioning, each comprising 41 to 46 credit hours. UTA's accelerated programs allow students to complete the program in 29 to 36 months. Core classes for all of UTA's online nurse practitioner master's degrees include advanced pathophysiology, principles of research in nursing, and exploration of science and theories for nursing. Specialized classes in pediatric care nurse practitioner programs emphasize knowledge and skills in managing pediatric patients' health problems, while the adult gerontology curricula focus on the needs of adolescents, adults, and elders in healthcare settings. The family nurse practitioner degree builds knowledge and skills in wellness, health, and conditions across the lifespan. All students complete clinical nursing practicum courses at preceptor locations to demonstrate degree competencies. To enroll in one of UTA's online master's in nursing for nurse practitioner programs, learners must demonstrate two years of clinical experience as a registered nurse within the concentration area. Applicants must hold a registered nursing license and submit transcripts reflecting a minimum GPA of 3.0 or higher, plus a bachelor's degree in nursing from an accredited program. Students with a GPA below 3.0 must submit GRE scores. UTA's nursing programs hold accreditation through the Commission on Collegiate Nursing Education. Chartered as a women's college in 1889, Georgia College now offers academic programs to more than 6,600 students through its four colleges. Georgia College boasts an average class size of 24 and a student-to-faculty ratio of 17-to-1. Based in Milledgeville, Georgia College provides additional educational opportunities to students at Robins Air Force Base and online. The online master of science in nursing program at Georgia College offers concentrations for family nurse practitioners, psychiatric-mental health nurse practitioners, and nurse educators. The master’s in nursing for family nurse practitioners prepares nurses to work as primary care providers in rural and underserved areas. Learners complete nine core courses in perspectives of advanced nurse practice, healthcare research and statistical analysis, healthcare safety, and principles and applications of nursing theory. Support courses in pharmacology, nursing assessment, and physio and pathophysiology accompany 22 credit hours of specialty classes in primary care across the lifespan. The 40-credit hour curriculum also includes a primary care practicum for students to apply theory, research, and decision-making skills under the supervision of a current nurse practitioner. Students complete a total of 630 clinical hours. Learners pursuing Georgia College's online master's in nursing degrees must complete clinical hours in the state of Georgia. For admission, applicants to one of Georgia College's Commission on Collegiate Nursing Education-accredited programs must hold a valid Georgia nursing license or demonstrate licensure eligibility. Applicants also need one year of clinical practice, prerequisite statistics coursework, and a bachelor's degree in nursing from an accredited program, demonstrating a minimum GPA of 2.75 for the last 60 hours of undergraduate coursework. Application materials include a formal application and fee, three letters of reference, a resume, a statement of goals, an interview, and an on-site writing exercise. Founded in 1801 and rechartered in 1906, UofSC hosts almost 35,000 undergraduate, graduate, and professional students at its Columbia, South Carolina campus and online. As one of eight schools in the University of South Carolina System, UofSC supports the state's educational, cultural, and research goals with degrees in the arts and sciences, business, law, public health, and nursing. UofSC offers master of science in nursing degrees for registered nurses seeking to build competencies as nurse administrators, adult gerontology acute care nurse practitioners, psychiatric mental health nurse practitioners, and family nurse practitioners. The online master's in nursing for family nurse practitioners curriculum trains students to provide primary care to patients across the lifespan, while preparing them to earn certification through the American Nurses Credentialing Center and the American Academy of Nurse Practitioners Certification Board. Core classes in the family nurse practitioner program emphasize theoretical and conceptual foundations of nursing, research methods and statistics, pathophysiology, and pharmacology. Students complete courses and campus immersions in children's primary care nursing and in advanced health assessment and diagnostic reasoning. Learners complete 672 clinical hours through a combination of coursework and a primary care practicum, during which students apply their degree knowledge and skills to practical experiences. Students apply to UofSC's nursing program for spring and summer start dates. Applicants must hold a bachelor's degree in nursing from an accredited program with a minimum cumulative GPA of 3.0. They must also demonstrate the completion of at least 600 clinical hours as a registered nurse within the past two years. Additional application requirements include a personal statement, three letters of recommendation, a current resume, and proof of nursing licensure. Programs offered by UofSC's College of Nursing maintain accreditation through the Commission on Collegiate Nursing Education and hold approval through the South Carolina Board of Nursing. Across its multiple locations in New York, Rochester offers academic programs to almost 10,000 undergraduate, graduate, and professional learners. As a private research institution, Rochester traces its origins to the late 18th century, but received its official charter in 1846. Currently, Rochester includes seven schools and colleges with eight additional patient care, technology, and culture centers and facilities. Rochester's online nurse practitioner program in family psychiatric mental health comprises 54 credit hours and 616 clinical hours. Students complete professional core classes in physiology and pathophysiology, pharmacology, research principles for evidence-based practice, ethics and public policy, and writing. Clinical coursework in psychiatric health assessment and diagnosis, group and family psychotherapy, and mental health disorders across the lifespan precede a comprehensive exam at the end of the program. Through practicum courses in family psychiatric mental health, students apply course knowledge and skills to clients, patients, and family treatment. Learners apply legal and ethical considerations to clinical diagnostic and decision-making experiences. Students demonstrate how to use degree information and evidence-based resources through clinical performance and case presentations. Applicants to the online master's in nursing program must hold an accredited bachelor's degree in nursing with a minimum GPA of 3.0. Additional requirements include valid registered nursing licensure, CPR certification, and one year of clinical experience in family practice mental health nursing. Applicants submit transcripts, two reference letters, a professional goal statement, a resume, and a writing sample for consideration. Programs offered by the School of Nursing at Rochester maintain accreditation through the Commission on Collegiate Nursing Education. The University of Colorado System maintains several campuses in the state, including the Anschutz Medical Campus in Aurora. The consolidated CU Denver and Anschutz Medical campuses offer 100 academic programs, including degrees in bioengineering, public health, pharmacy, and nursing. CU Denver and Anschutz Medical Campus offer 12 master’s in nursing degree specializations. Nurse practitioner concentrations in adult-gerontology, family nursing, women's health, pediatric nursing, and psychiatric mental health accompany an online nursing leadership and healthcare systems degree. Called the i-LEAD (Innovation in Leadership and Administration) in nursing and healthcare systems program, the degree prepares students to effectively lead and manage in a variety of healthcare settings. The 30-credit hour i-LEAD program aims to address social, cultural, and policy obstacles in healthcare services. To accomplish this, the degree trains students to reduce health disparities by building expertise in healthcare systems, informatics, research, and evidence-based practice. Learners in this program also complete an administrative internship. The i-LEAD program additionally prepares learners to pursue optional certification in healthcare informatics or to continue onto several doctoral programs. Students can complete up to 12 credit hours of the i-LEAD program as non-degree-seeking students. Application requirements for the program include an undergraduate nursing degree with a minimum 3.0 GPA and a current, unencumbered nursing license. Applicants submit a formal application and fee, a resume, three reference letters, a prompted essay, and transcripts. Interviews for selected applicants take place on-site. The i-LEAD program holds accreditation through the Commission on Collegiate Nursing Education. As the second-largest Catholic university in New England, SHU offers academic programs on its Fairfield, Connecticut campus and online. Founded in 1963, SHU offers online master’s in nursing degrees for family nurse practitioners as well as degrees in nursing management and executive leadership, nurse education, and clinical nurse leadership. Coursework for the clinical nurse leadership online master's program prepares current nurses for advanced generalist clinical roles. Students develop competencies in patient evaluation, risk assessment, and collaborative healthcare, which helps them provide care to patients of all ages and populations. Learners complete core coursework in healthcare policy and ethics, theory and professional roles, and evidence-based practice. They also take specialized clinical nurse leader classes in family and community context for healthcare, comprehensive health assessment methods, care management and resources across the continuum, and disease management and outcomes assessment. Additional classes in pathophysiology and pharmacology precede a clinical nurse leader role immersion practicum and a clinical nurse leadership capstone. Designed as a sequence, the practicum and capstone course allow students to apply degree content and work with preceptors in a clinical setting. During the program, students complete 348 hours of role immersion. After completing the online clinical nurse leader master’s degree, learners may sit for the American Association of Colleges of Nursing Clinical Nurse Leader Certification Exam. SHU's program holds accreditation through the Commission on Collegiate Nursing Education. All of SHU's online nursing programs feature asynchronous coursework, and SHU offers six start dates per year, with no residency requirements. Applicants need an associate degree or diploma in nursing, plus a bachelor's degree in any field. Additional admissions requirements include a current, unencumbered nursing license, a statement of professional goals, a resume, two letters of recommendation, and a background check. Founded by Jesuits in 1878, Creighton has since grown from its initial class of 120 students to its current enrollment of more than 8,000 learners. Based in Omaha, Nebraska, Creighton offers academic programs through nine schools and colleges, including the College of Nursing. Creighton's College of Nursing offers two online master of science in nursing degrees, both accredited by the Commission on Collegiate Nursing Education. The clinical systems administration program prepares nurses to work within the corporate healthcare field, while the clinical nurse leader degree equips graduates to provide inpatient and outpatient care. The master's in nursing with a clinical nurse leader specialization comprises 37 credit hours and 600 clinical hours, earned through online coursework and on-site practicum experiences, respectively. Students complete research and theory courses in statistics, evidence-based outcomes, and evaluative methods, along with leadership and policy classes in care management and practical ethics. Later in the program, learners complete role and specialty coursework. Classes in advanced health assessment, pharmacology, and pathophysiology blend laboratory and clinical hours with specialized content in preparation for a clinical nurse leader residency. Students complete the 300-clinical hour residency during the program's final semester. Applicants to Creighton's master's in clinical nursing leadership degree may take core classes before completing the 2,000 clinical hours required for clinical courses. Learners must hold an accredited bachelor's degree in a related field and demonstrate a GPA of 3.0 or higher and eligibility for a Nebraska nursing license. Applicants submit official transcripts, a personal statement, three letters of recommendation, and a formal application and fee. UAB provides academic programs to almost 21,000 undergraduate and graduate learners. Founded in 1859 as a medical college, UAB now functions as the only public, four-year degree-granting university in the Birmingham metropolitan area. The school is also the state's largest single employer as well as its largest research institution and is home to the nation's third-largest public hospital. As one of three schools in the University of Alabama System, UAB offers nursing programs accredited by the Commission on Collegiate Nursing Education through its nursing school. UAB's School of Nursing offers online nurse practitioner programs with nine specialties, including family, psychiatric-mental health, pediatric primary care, neonatal, and adult gerontology primary care. Students complete 45 credit hours, including 32 didactic hours and 13 hours of clinical courses. Learners must also complete 600 hours of direct patient care. All of UAB's master's in nursing degrees prepare practicing nurses to synthesize research, theories, and principles of nursing to provide evidenced-based care to patients and clients. Students gain leadership and managerial skills while building independent and collaborative practical competencies. Core classes in each of the nurse practitioner degrees include leadership in advanced nursing practice roles, translating evidence into practice, healthcare systems for advanced nursing practice, and assessment and diagnostic reasoning. Learners study field-specific topics by blending advanced content classes with practicum and residency requirements. Applicants to UAB's online nursing program must hold at least a bachelor's degree in nursing from an accredited institution and an unencumbered nursing license in the state where clinical practica will take place. Students submit transcripts, GRE scores, and three reference letters for consideration. Founded in 1918, BSU offers almost 200 undergraduate and over 115 graduate programs through its seven academic colleges. BSU's more than 21,000 students studying at the campus in Muncie, Indiana and online enjoy high levels of faculty engagement with the school's 15-to-1 student-to-faculty ratio. BSU's online master of science in nursing for family nurse practitioners comprises 47 credit hours. Students complete six hours of research, statistics, and data analysis, with eight credits of nursing core classes in nursing theory, nursing information technology, and nursing concepts in health promotion and disease prevention. Family nurse practitioner primary care courses blend primary care content with clinical experience, emphasizing advanced practice nursing roles and theories. Learners study primary care best practices for adults, children, and women before completing a family nurse practitioner practicum. Over the course of the program, students complete 690 supervised clinical hours. BSU's online master's in nursing for family nurse practitioners prepares learners to apply for family nurse practitioner certification through the American Nurses Credentialing Center and the American Academy of Nurse Practitioners Certification Board. The program maintains accreditation from the Commission on Collegiate Nursing Education. To apply to BSU's online master's in nursing program, learners must submit documentation to the graduate school and the nursing school. Applicants must hold a bachelor's degree in nursing from an accredited institution with a minimum GPA of 3.0. They should also submit proof of an unencumbered nursing license. Admitted students must participate in an one-day, on-campus orientation. Drexel in Philadelphia, Pennsylvania offers more than 200 degrees through 15 colleges and schools. Since its 1891 foundation, Drexel's enrollment has grown to almost 25,000 students, including nearly 5,000 in online programs. With more than 15 online master's in nursing degrees, Drexel's College of Nursing and Health Professions offers several concentrations for nurse practitioners. The adult gerontology acute and primary care nurse practitioner tracks require 57 and 52 credit hours, respectively, while the women's health/gender related nurse practitioner program comprises 55 credit hours. The family nurse practitioner degree, designed to prepare learners to work with individuals across the lifespan, requires 56 credit hours, and the clinical nurse leader curriculum mandates 48. Learners in all programs complete core and support classes in issues in contemporary healthcare environments, pharmacology, clinical assessment and diagnostic reasoning, and evaluation and translation of health research. Specialized courses include clinical components, giving students the opportunity to apply their degree knowledge and skills in practical settings. During each program, students benefit from various delivery formats, including synchronous online lectures and on-campus simulation exercises. After completing their programs, learners may apply for certification, such as the women's health nurse practitioner certification through the National Certification Corporation or the adult-gerontology acute care nurse practitioner certification through American Nurses Credentialing Center and the American Academy of Nurse Practitioners Certification Board. For admission to Drexel's online master's in nursing degrees, learners need a current, unrestricted nursing license. Applicants must hold a bachelor's in nursing degree from an accredited program, demonstrating a cumulative GPA of 3.0 or above. They must also submit a formal application, transcripts, two letters of recommendation, a personal statement, and a resume showing one to two years of prior work experience (preferred). Drexel's nursing program holds accreditation from the Commission on Collegiate Nursing Education and approval from the Pennsylvania State Board of Nursing. As a Jesuit institution founded in 1877, Regis holds distinction as the only Jesuit Catholic university in the Rocky Mountain region of the United States. Based in Denver, Colorado, Regis offers academic programming for more than 10,000 students across more than 130 programs, with a 14-to-1 student-to-faculty ratio. Regis houses seven academic colleges, including the Rueckert-Hartman College for Health Professions, home to the institution's Loretto Heights School of Nursing. Regis' online master's in nursing degrees offer concentrations for neonatal nurse practitioners and family nurse practitioners, both accredited by the Commission on Collegiate Nursing Education. The online master's in nursing for family nurse practitioners offers two pathways. The traditional pathway includes face-to-face instruction one day a week, but the track for family nurse practitioners in rural and underserved communities provides a low-residency option. The synchronous curriculum includes weekly online interactive classes, plus five on-campus intensives throughout the program. Students complete 48 credit hours of classes in nursing theory, pharmacology, healthcare policy, and primary care procedures. Learners also complete 630 clinical hours at a location in their home rural area. An optional thesis adds six additional credit hours to the curriculum. To apply to Regis' online master's in nursing for family nurse practitioners, learners submit a formal application, three letters of recommendation, a prompted statement, and a current resume. They must also provide transcripts verifying a bachelor's degree from an accredited institution with a minimum GPA of 2.75. Some applicants may participate in a personal interview. Structures and formats of online master's in nurse practitioner programs vary by school. Consider the details of each prospective program carefully. Degree requirements also vary, so consider each of these factors before selecting a program. Online nurse practitioner programs require applicants to possess a bachelor's degree in nursing. Often admissions requirements lay out a minimum undergraduate GPA, as well. Candidates usually need a minimum 3.0 GPA, though the threshold varies between schools. Schools also prefer candidates to have earned satisfactory grades in statistics or health assessment courses. Prospective students must hold an unencumbered nursing license, ideally valid in the state where they hope to attend school. Some admissions departments only require proof of applicants' licenses, while others require candidates to have completed at least a year of work as a professional nurse. Many of the top online nurse practitioner programs expect applicants to submit essays and recommendation letters, and interview with a faculty member. Because of these requirements, most universities do not require GRE scores. Although the scope and focus of coursework vary by program, most online master's in nurse practitioner degree programs include similar foundational courses. Below are a few sample courses, common to many nurse practitioner curricula. Advanced Pharmacology: This course examines pharmacology, pharmacokinetics, and pharmacodynamics. Students learn to ethically and cost-effectively manage prescription medications. Advanced Physiology: This course delves into physiology across the entire lifespan. Students learn what factors cause and influence acute and chronic illnesses, equipping them to diagnose and treat these illnesses. Diagnostic Reasoning: This course teaches students to diagnose and treat acute and chronic illnesses. Each online nurse practitioner program provides a unique curriculum, teaching a unique set of skills of competencies. However, most programs cover similar fundamentals, so nurse practitioners enter their industry with common expertise. Read more about the specific skills learned in NP programs -- and how they set nurse practitioners apart from registered nurses -- below. Pharmacology: Nurse practitioners must have acute knowledge of medications and how they affect the human body. NP programs often require courses in pharmacology and advanced practice pharmacotherapeutics to provide students with this competency. Advanced Pathophysiology: Pathophysiology involves an understanding of human diseases and their physical symptoms. Nurse practitioners study this discipline at the advanced level, in order to see and diagnose patients. Assess Health: Nurse practitioners boast more autonomy than registered nurses at healthcare organizations, meaning NP students must learn how to visit with patients and assess their health status without a doctor. Diagnose Patients: Unlike registered nurses, nurse practitioners can identify acute illnesses in patients. In nurse practitioner master's programs, students gain learn to diagnose patients through advanced coursework. Prescribe Medication: Nurse practitioners provide treatment plans and assist patients in following those treatment plans. They also hold the authority to write prescriptions for medications within their field of specialization. Nurse practitioner curricula typically include some real-world experience requirements, often in the form of clinicals or practicum courses, where NP students spend 500-700 hours working in a healthcare facility. Students may also need to complete a graduate research project or thesis, or take a capstone or final seminar. Family Nurse Practitioner Certification: Nurse practitioners can attain their family nurse practitioner certification from either the American Nurses Credentialing Center (ANCC) or the American Academy of Nurse Practitioners (AANP) certification board. This credential allows NPs to work with patients across their lifespan, from infancy to old age. The certification exam covers physical assessments and pharmacology for treating patients. Adult-Gerontology Nurse Practitioner Certification: Also offered by both the ANCC and the AANP, this credentials certifies that NPs can assess and diagnose patients ranging from adolescents to young adults. The exam covers cardiovascular, gastrointestinal, psychiatric, and respiratory issues, among others. Professionals with this certification also hold expertise in health promotion and maintenance. Candidates should possess at least a master's degree and a registered nursing license. Psychiatric-Mental Health Nurse Practitioner Certification: Nurse practitioner graduates may take this certification exam from the ANCC. Candidates for this certification need to know the same anatomy and physiology as other certifications, but this credential focuses more on patients' health states. The exam centers on assessing and diagnosing neurological functions. Applicants must hold an RN license, plus a master's or doctoral degree. Several factors impact the time it takes to complete an online master's in nurse practitioner program. For example, students in cohort-based programs work in groups, and may take longer to complete their degrees. On the other hand, individually paced programs are flexible, allowing students to complete coursework on their own schedules. Family nurse practitioner master's degrees generally require 60 credit hours, which full-time students may complete in three years. Part-time students may take longer to complete their degrees. Program length also partially depends on whether courses are synchronous or self-paced. The healthcare industry is currently experiencing a shortage of medical professionals, including doctors. This shortage has increased the demand for nurse practitioners, who help fill in gaps by providing highly skilled care in a variety of medical disciplines, either as primary care providers or in supervised specialty positions. Nurse practitioners are in an ideal position to increase their earning potential and take advantage of new career opportunities. This ranking of the top online nurse practitioner degrees can help you evaluate which programs and medical disciplines best fit your long-term career goals. The medical disciplines with the highest pay and required training are also the ones with the highest demand. These disciplines include psychiatric, critical care, and neonatal/pediatric nursing. The best online master's programs prepare nursing students to pursue these fulfilling and lucrative degree options by offering a wide variety of learning formats and curriculum options to meet the needs of all distance learners. Family nurse practitioners (FNPs) provide the same services as family practice physicians, including consulting with patients, diagnosing illnesses, administering treatment, and prescribing medication. These professionals earn a median annual salary of $90,000, and work in a wide variety of healthcare facilities, including private and public clinics, medical centers, nursing homes, hospitals, and private residencies. Due to the current national shortage of internal medicine and and primary care doctors, authorized family nurse practitioners in many states operate their own autonomous private practices as primary healthcare providers. Entering this rewarding career typically requires an MSN, plus family nurse practitioner board certification. Many students can complete their online family nurse practitioner programs in just two years. Psychiatric nurse practitioners are highly specialized RNs who work with mental health professionals, including doctors of psychiatry. These professionals perform mental health assessments, provide therapy and counseling, prescribe psychopharmaceuticals and other medications, and develop holistic treatment plans for their patients. As the awareness of the need for accessible healthcare expands, employment opportunities in this field also increase. Psychiatric nurse practitioners earn a median annual salary of more than $100,000, and practice in a variety of specialized nursing areas. For instance, nurses with skills in serving high-need populations -- such as substance abusers, children, adolescents, and the elderly -- are in high demand. Many nurses in this field have graduated from online psychiatric nurse practitioner programs. Neonatal/pediatric nurse practitioners are trained to work as primary or specialty care providers for children from infancy through adolescence. These professionals conduct routine exams, diagnose illnesses, and prescribe medications. They typically work under a pediatrician in a medical clinic or hospital, though some operate their own independent practices. Neonatal nurses generally work with premature or high-risk newborns in hospitals' neonatal intensive care units. These highly specialized professionals earn median annual salaries of above $96,000. Neonatal/pediatric nurse practitioners commonly require advanced training beyond a bachelor's degree and board certifications. Online pediatric nurse practitioner programs offering MSN degrees provide an attractive option for many advanced nursing students. Geriatric nurse practitioners work exclusively with older patients facing distinctive healthcare challenges. Also known as gerontological nurse practitioners, these professionals treat age-related conditions and place a major focus on preventative care to improve their patients' quality of life. The aging U.S. population a has longer life expectancy than previous generations, but with it comes a growing rate of medical impairments, like hearing loss, osteoporosis, dementia, and higher risks from minor injuries. As a result, the demand for nurse practitioners is growing in nursing homes, hospices, hospitals, clinics, and home healthcare. Geriatric nurses typically work under physician supervision as part of a team of nursing staff, social workers, physical therapists, dieticians, and other geriatric professionals. They may also work as independent primary care providers in a private practice. Critical care nurse practitioners provide specialized care to patients with chronic, acute, and critical life-threatening conditions, including brain injuries, cardiac arrest, strokes, and organ and respiratory failure. These nurses typically work in intensive care units, emergency rooms, rapid response teams, and burn units. Due to the challenging, high-stress conditions associated with critical care, these professionals earn high pay, with annual median salaries of $98,000. Nurses who have graduated from critical care nurse practitioner online programs and received certification through the American Association of Critical Care Nurses enjoy high demand. In turn, online acute nurse practitioner programs are on the rise. Emergency nurse practitioners work as advanced practice registered nurses, treating patients in hospital emergency rooms and acute care facilities. These professionals perform medical procedures and generally administer to patients of all ages seeking emergency attention for a variety of conditions. These conditions range from severe injuries and acute, life-threatening illnesses to other urgent care needs, such as food poisoning or allergic reactions. Due to the projected shortage of emergency physicians, licensed nurse practitioners are in high demand. Emergency care nurses typically complete educational programs with dual fields of study. For example, students interested in emergency nurse practitioner programs online often combine this specialization with a degree in family nursing or gerontology. Women's health nurse practitioners specialize in ongoing, comprehensive, holistic healthcare for women from puberty through their senior years. Unlike certified nurse midwives, who specialize in childbearing, women's health nurse practitioners provide a broad spectrum of services to women of all ages. Their expertise is not restricted to gynecological and reproductive care, and they often work in medical offices and clinics rather than in delivery rooms or hospitals. They also provide preventive care and healthcare education about women-specific issues. Certification is not required in all states, but the women's health nurse practitioner -- board certified credential has become a valuable asset for professionals who want to advance their career. In choosing the best online degree for you, consider each potential program's accreditation. Most schools have regional accreditation, and some may have national accreditation. The Higher Learning Commission gives regional accreditation to schools that meet its criteria. The Accreditation Commission For Education in Nursing and the Commission on Collegiate Nursing Education agencies both give accreditation to nursing and nurse practitioner programs. The U.S. Department of Education handles policies in U.S. school systems. This agency also provides aid and assistance to students, who must submit their Free Application for Federal Student Aid (FAFSA) each year to receive financial aid. The U.S. Department of Education and the Council for Higher Education Accreditation both provide comprehensive lists of their accredited post-secondary schools. Check their websites to find the best online nurse practitioner degrees. With all the careers available in the nursing field, deciding which is best for you can be difficult. However, if you want a higher salary, consider becoming a nurse practitioner; on average, they earn the highest salaries of all nursing professions. The table below uses data from the BLS to compare salaries among types of nurses. Nurse practitioner master's degrees open up a wide range of career opportunities. The table below outlines the median salaries for nurse practitioners in their five most common industries. Nurse practitioners work in all kinds of settings and environments, from hospitals to rehabilitation centers. After earning their master's degree, graduates may pursue a variety of careers, or further education at the doctoral level. Nursing students are valued for their patience, compassion, and strong work ethic, putting them in demand. Below are examples of careers for nurse practitioners. Nurse practitioners, or advanced practice registered nurses, care for patients, prescribe medications, and diagnose acute and chronic illnesses. LPNs perform basic nursing care activities under the supervision of registered nurses. They generally work in specialized areas, such as long-term care facilities or elderly nursing homes. Registered nurses provide patient care, advice, and support in settings such as schools or the military. These nurses work with patients dealing with both acute and chronic respiratory illnesses. They help administer breathing and respiratory treatments. These professionals advise and guide patients needing dietary and nutritional support, helping patients lead healthy lifestyles. Professional organizations offer students resources, conference opportunities, and methods for broadening their knowledge of the field. These organizations help graduates find jobs and network with other nursing professionals. Below are examples of prominent professional organizations in the field of nursing. The ANA advocates for the millions of U.S. nurses. The ANA works to achieve and maintain healthy, safe, and ethical work environments, while promoting excellence in nursing care standards. The AANP is the largest national organization for nurse practitioners, offering members full support and professional development. They host the Specialty & Leadership Conference each year. Sigma Theta Tau is an international honor society for nursing. They support nurses pursuing higher degrees and continuing education, and they provide networking opportunities to connect members with other nursing professionals. Including scholarships, loans, and grants, students have an array of options to finance their master's in nurse practitioner degree. Large corporations, like Johnson & Johnson, offer scholarships for undergraduate and graduate nursing students. Also check with local and national nonprofit nursing organizations for scholarship opportunities. All online students should begin by filling out the FAFSA. Students applying for aid must enroll in an master's program that is accredited by a federally recognized agency. Students in nurse practitioner programs may also apply for program-specific scholarships through organizations in the field. Approximately two-thirds of today's college students rely on loans to fund their education, but plenty of overlooked financing options may reduce overall student debt. Financial aid for online learning is equivalent to what you'll find for campus-based learning, but that hasn't always been the case. Learn about what changes have taken place, plus the different funding opportunities available to online students. Millions of dollars are available to U.S. military personnel, but much of it goes unused. Learn more about grants, scholarships, and other financial aid opportunities available to veterans, active-duty service members, and reservists.